HUTCHINSON, Kan. – Defense became the calling card on Saturday, as the No. 8 Lady Saints beat No. 2 Iowa Western 4-1 (25-21, 24-26, 25-19, 25-19) and No. 17 Missouri State West Plains 3-1 (25-15, 8-25, 25-21, 25-21). The win over No. 2 Iowa Western is the highest win over a ranked opponent in Seward County history. It was a battle between two top ten teams in the first match of the day. Though both teams were landing their attacks with ease, mistakes on both sides allowed the other to stay in the set. With the match tied at nine, the Reivers got two attacks to land to take a two-point lead. After the Reivers took a three-point lead, Luz Sierra took over, picking up two aces and a kill, while Iowa Western came away with a net error to give Seward their first lead of the set at 15-14. Seward continued to push their advantage, taking a four-point lead late in the match at 21-17. The four-point advantage was all the Lady Saints needed, as a blocking error ended the set to give Seward the 25-21 set one win. The second set began in Iowa Western’s favor, going on a four-point run to take an early three-point lead at 6-3 to force an early Seward timeout. The timeout worked wonders, as déjà vu set it. It was Sierra again who changed the tides of the set, picking up four straight blocks as the Lady Saints went on a 5-0 run to take a two-point lead. Another timeout, this time by Iowa Western, allowed the Reivers to slow Seward’s momentum, tying the set at nine before taking a two-point lead with back-to-back kills. Once again, it was defense that sparked a change of momentum as Dorianne Lebron came away with a block to spark another 5-0 run as Seward went up 16-13. The lead quickly dwindled, however, as the Reivers tied the set 20 before taking over the Lady Saints 23-21. Seward tied the set at 24, but the Reivers came away with back-to-back kills to even the match at one set a piece. It was another tight set to begin the third, but a 3-0 run gave Seward an 11-8 lead with two Tapigliani kills and a Laura De Pra ace. Seward extended their lead to five, but it quickly diminished as the Reivers tied the set at 16 with a 5-0 run. After a timeout, head coach Tony Trifinov refocused Seward, as the Lady Saints went on their own 5-0 run to take a late 21-17 lead. That lead was all the Lady Saints needed as they won set three 25-19 to take a 2-1 advantage heading into the fourth set. The evenly matched teams continued to spar in the fourth set. Serving errors began to become a problem for Seward, giving the Reivers four of their first 12 points. Neither team could establish momentum, with the opposing side having an answer at each turn. With the set tied at 16, the Lady Saints managed a 3-0 run, forcing a Reivers timeout as each point became more crucial. The timeout missed its mark, however, as the Lady Saints went on to win the fourth set 25-19 and upset the second ranked team in the country. Tapigliani once again led the Lady Saints on offense coming away with a season-high 23 kills. Schmorantz and Sierra joined Tapigliani in double-digits with 15 kills and 11 kills respectively. Laura De Pra came away with her second straight 50 assist match, as she helped lead put the team in place to hit a combined .510 against the Reivers. 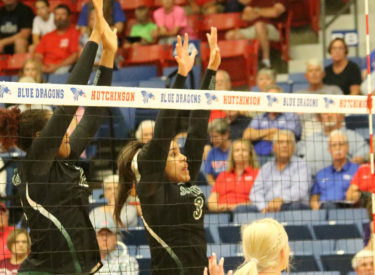 The difference in the match came down to defense as the Lady Saints came away with eight blocks in the match. Sierra led the way, finishing with seven blocks on her own. Esmadar Tavares, Dorianne Lebron and Tapigliani each finished with one block. Following a brief break in action, the Lady Saints went back to work, taking an early four-point lead in the first set with a kill by Giovanna Tapigliani down the right line to make it 10-6. After the Lady Saints went up six points, the Grizzlies went on a 4-0 run to make the score 12-10, forcing a Seward timeout. Coming out of the timeout, the Lady Saints scored seven of the next nine points to take a seven-point lead and force a Grizzlies timeout. The timeout didn’t work as planned though, as the Lady Saints went on to win set one 25-15. Seward looked sloppy the entire second set., quickly falling behind 9-0 while they struggled to pass the ball. Dorianne Lebron broke the run, but the Grizzlies entered another 9-0 before the Lady Saints could score again, putting them in a 16-point hole. The Lady Saints tried to go on a run, but it was too little, too late as the Grizzlies ran away with set two 25-8. The Lady Saints continued to struggle to find their rhythm, falling into a four-point deficit to begin the third set. Seward cut the lead to one with a Tapigliani kill to make it 11-10, but the Grizzlies answered with back-to-back blocks. Seward managed to take their first lead of the set shortly after with a 3-0 run. After a brief tie, the Grizzlies went on a late 3-0 run to take a 20-17 lead late in the set to force a Seward timeout. The timeout worked to perfection as the Lady Saints went on a 8-1 run to take the second set 25-21 and take a 2-1 advantage. Though Seward held the momentum heading into the fourth set, it was the Grizzlies that started off with the lead, as the Lady Saints missed attacks and fell behind 10-6. After a timeout by the Lady Saints, Seward tied the set at 10 with a Tapigliani kill down the right line before taking the lead with another Tapigliani. The lead didn’t last though, as the Grizzlies called a timeout of their own and retook the lead 16-14. After getting an ace and extending their lead to 19-16, the Lady Saints called a timeout. As was the case in the first match of the day, Luz Sierra took over, scoring five of the next six points to give Seward the 21-20 lead. Just as the third set went, the Lady Saints finished on a monster run following a late timeout, this time finishing on a 9-2 run to win set three 25-21. Offensively, the Lady Saints were led by Tapigliani who came away with a team-high 18 kills. Luz Sierra finished with double-digit kills also, finishing with 11. Sierra added four blocks on the defensive end to finish with 15 points. Riding a 15-game winning streak, the Lady Saints will head back to the Greenhouse to take on No. 20 Colby on Monday at 6:30 p.m. for a battle for first place in the Jayhawk West. The Lady Saints ask fans to wear white to the match for as Seward tries to whiteout the Trojans.